More than 10 local tourism companies take part in bilateral meetings with tourism companies from the Middle East region and Saudi Arabia to promote tourism potential of the country. Azerbaijan Tourism Board has been awarded "Gold Sponsorship", which creates special opportunities for various promotional platforms within the framework of the exhibition. The exhibition has been a successful platform for adventurous tourism cooperation for eight years, bringing together key tourism participants in the Middle East region. The official tourism agency of our country operates in Saudi Arabia since December of last year. Tourism offices aim to introduce Azerbaijan's tourism opportunities, conduct propaganda and campaigning. 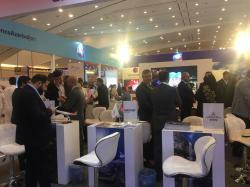 Previously, our country was represented at the 13th IBTM Arabia in Abu Dhabi, the United Arab Emirates, to promote Azerbaijan's business tourism opportunities in the Middle East. Presentation of Azerbaijan's potential for holding international business meetings during bilateral and multilateral meetings met with interest at the event attended by the Azerbaijan Convention Bureau. Azerbaijan is among the fastest-growing destinations for tourists. The beautiful nature of Azerbaijan, hospitality of its people, the country's capital with its super modern and ancient buildings draws the attention of all tourists visiting this South Caucasian country. In recent years, trade and tourism relations of Azerbaijan with Gulf countries are growing rapidly. Currently there are favourable conditions for development of tourism between Azerbaijan and Saudi Arabia. According to the State Statistics Committee of Azerbaijan, in 2018, as many as 2,849,600 tourists from 196 countries visited Azerbaijan, and Saudi citizens accounted for about 2.6 percent of those arriving in the country. As many as 7,500 tourists from Saudi Arabia visited Azerbaijan in 2016, 33,000 tourists visited the country in 2017, and 73,000 tourists from Saudi Arabia visited Azerbaijan in 2018. However, the influx of tourists is observed only in the summer. Simplification of visa regime also played a major role in the growth of tourist flow from Saudi Arabia. In February 2016, Azerbaijan simplified the procedure of obtaining visas for citizens of Saudi Arabia and other countries of the Persian Gulf. It’s noteworthy that Saudi Arabia facilitates to increase flow of Arab tourists to Azerbaijan. The Saudi Travel and Tourism Association is developing a "road map" to provide assistance in attracting Arab tourists to Azerbaijan. The "road map" is designed for five years. All aspects of the cooperation of the sides will be coordinated with the State Tourism Agency of Azerbaijan. Saudi Arabia will also attract tourists to Azerbaijan, and will ensure an annual increase in investment in the country at a level of at least five percent. Recently, Flynas, Saudi Arabia's leading low-cost airline, has announced its plan to launch flights to Baku. That will contribute to the further growth in tourist flow to Baku from Gulf countries.